← Where, O Death, Is Now Thy Sting? People always talk about Saint Peter. “What a horrible case of foot in mouth disease he had,” they say. “Got it wrong more times then he got it right,” they say. “Denied he even knew Jesus… three times,” they say! And, of course, they are right. Maybe that is why he considered Saint Mark to be his son. 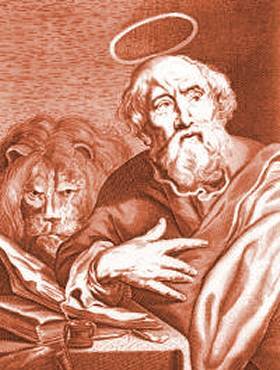 Yes, St. Peter had his share of mistakes, but St. Mark had just as many, if not even worse. So, St. Mark abandoned St. Paul and St. Barnabas, his cousin, remember, on this missionary journey when the times had gotten tough. There was a problem; they faced rejection and persecution from the Jews; Mark bailed on them. Later on, when St. Paul and St. Barnabas were ready to go off again, St. Barnabas said, “Let’s give him another chance,” and St. Paul said, “Over my dead body.” The dissension between these two missionaries who had so powerfully moved in Asia Minor that they had been mistaken for Zeus and Hermes became so great that they parted ways and did not minister together again! Yes, St. Mark was the Yoko Ono of the early missionary church. That puts him up there with St. Peter, I would think. There is a unique pair of verses in St. Mark’s account of the arrest of Jesus in the Garden of Gethsemane. As Judas betrays Our Lord and the guards arrest him, the Evangelist tells us, “Now a certain young man followed Him, having a linen cloth thrown around his naked body. And the young men laid hold of him, and he left the linen cloth and fled from them naked.” (14:51-52) This passage is unique in the New Testament. Saints Matthew, Luke and John make no mention of the young man. Many believe that this passage is St. Mark inserting himself into the story. It was customary not to identify yourself as an author of a work in the Ancient Near East and none of the Gospels are attributed to their authors within the text. It is tradition that tells us who wrote which. The inclusion of this passage in St. Mark’s Gospel suggests that it may very well have been the Evangelist himself. So, not only did he break up the Disciples’ Dynamic Duo, he also ran so hard and fast away from Jesus when Our Lord was arrested that he tore off his clothes to get away. St. Peter may have denied Him, but at least he kept his clothes on! But, wait! This last screw up, we read about it in the Gospel According to Saint Mark! Indeed, the young man rebounded from these two catastrophic showings and managed to pull himself together and make something of himself. Later, St. Paul referred to St. Mark as “a fellow laborer” and “useful to me.” (Philemon 24 and 2 Timothy 4:11) At some point, St. Mark attached himself to St. Peter who, perhaps realizing the young man had a record of failing not unlike the Prince of the Apostles himself, referred to St. Mark as “my son.” (1 Peter 5:13) Tradition tells us that, having ministered extensively with St. Peter, St. Mark recorded St. Peter’s recollection of the life of Christ and compiled the work into the Gospel According to St. Mark. 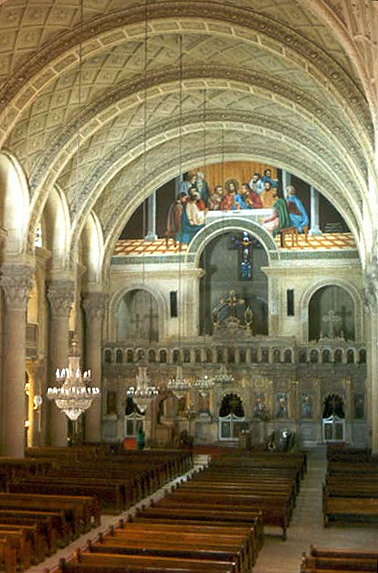 Leaving Rome after St. Peter’s death, St. Mark moved south to Alexandria and established the first Christian Churches in Egypt. As St. Peter is regarded as the first bishop of Rome and the current Pope considers himself the “heir of the throne of St. Peter,” His Holiness Pope Shenouda III, the head of the Coptic (Egyptian) Church considers himself to be the heir to the throne of St. Mark. Legends say that St. Mark was finally martyred in the streets of Alexandria for speaking out against a pagan festival. And there is the lesson for us. The young man named Mark was a failure in so many ways. He ran so hard and fast away from Christ that he lost his clothes. He ran so hard and fast away from Saints Paul and Barnabas that he prevented them from ever working together again. Yet, ultimately, he embraced the Cross of Christ to the point of recording the Gospel so that more than half of what we know about the life of Christ can be attributed to St. Mark. Many scholars, after all, suggest that Saints Matthew and Luke used a copy of St. Mark’s Gospel when writing their own Life of Christ. Beyond that, he embraced the missionary life from which he had fled earlier and established one of the great patriarchates of early Christianity. Rather than fleeing persecution, he finally faced it and received the martyr’s crown of life in Heaven. No matter how often we fail, no matter how often we run away from what we are called to do, we may still embrace the Lord. He will always receive us again and include us in His plan, not merely as an anonymous bit player, but as a key figure who touches many and changes life. It is never too late to embrace that which Christ has called you to do. Just pick up the Gospel According to St. Mark and you will see a fine example. Very inspiring! I truly enjoy reading your blog since I learned about it. Thanks, Erick. I’m glad you’re enjoying it! Thank you, Fr Looker, for this beautifully written piece about Saint Mark. Our school, Saint Mark’s School in San Rafael, CA, is changing its name next year. I was looking into why perhaps our founding headmaster and a local Episcopal priest had named our school for him. I found inspiration in your writing that I will share with the name change committee. Thank you for your kind words, Kelly. May God bless you and St. Marks’ School. I know how hard it is working in Christian Education. God’s blessing be upon you and your colleagues. I’m glad my writing inspired you.